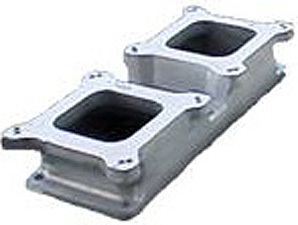 A 2.75-inch tall aluminum casting with 8 5/8 inch center to center carb measurement that will work with Holley, Carter, and Edelbrock carbs. Holley carbs can also be mounted sideways. We stock linkage kits for all applications, as well as 1x4, 3x2, and 2x4 high rise adapters. Use linkage P/N 50070 for inline carbs and P/N 50069 for side mount carbs. Available in satin or polished finish.